The leading manufacturer of mobile phones, Samsung Electronics has announced its Samsung Diva Collection 2010 with two new phones which named as Diva (S7070) and the Diva folder (S5150). 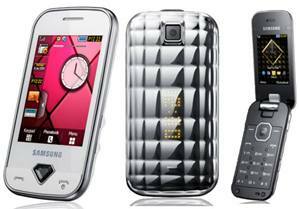 The phones from Samsung Diva Collection 2010 are targeted to the ladies mobile phone users. The new Samsung Diva (S7070) is being designed with a pearly-white embossed quilted back cover and a diamond-shaped crystal button on the front. The S7070 features with a 2.8-inch TFT LCD display with 240 × 320 resolutions and a 3.2-megapixel camera featuring ‘Beauty Effect’ and ‘Lomo Effect. It also includes other features like pop-up SNS for fast notification on Facebook and MySpace updates, a multi-instant messenger, ‘Fake Call,’ ‘Etiquette Mode,’ ‘Wish List’ or ‘SOS Message’, music player and FM radio. In addition, it comes with a 960mAh battery that supports up to 10 hours of talk time and up to 800 hours of standby time. The Samsung Diva folder (S5150) comes with a sliver-toned back cover with a 3D quilted pattern. The phone features with a hidden LED, called “glittering LED,” illuminates to notify an incoming message or a call. The Diva folder also offers various image editing features such as ‘Beauty Shot’ and ‘Lomo Effect’, and built-in security features including ‘SOS Message’ and ‘Fake Call’. In addition, it comes with a 800mAh battery that supports up to 7 hours of talk time and 470 hours of standby time. According to the company, the new Samsung Diva Collection 2010 is set to be launched in January 2010 in the Netherlands, Russia, Ukraine and other European countries, followed by Southeastern Asia and China.